By the weekend, I was itching to do some hunting and decided to look for some online bargains…that doesn’t take much energy! (Good plan.) I curled up on the couch with my quilt and laptop and perused vintage and antique jewelry on eBay and Etsy for over 90 minutes. And darned if I couldn’t find one thing to buy. Not one. Don’t get me wrong, there were plenty of beautiful, appealing pieces, but nothing I wanted would leave me enough room for profit. This was strange because I have always been able to find nice, undervalued pieces online. There were scads of those huge, jumbled junk jewelry lots. I know there are people who love buying these. Folks always think they are going to find real gold in all the junk. Or something with diamonds. It rarely, rarely, rarely happens. Instead you get a lot of low end, crappy jewelry with a fair sprinkling of broken pieces. A waste of money in my humble opinion! The other day I finally popped into my neighborhood Goodwill for the first time in a week. Felt good to be out hunting. Lately this little store has been lite on vintage stuff, but I was hopeful that there would be something there for me. Just one thing. That’s all I wanted! And there was… a very cool, mid-century Nilsjohan brass, glass and copper food warmer from Sweden. I sold a wonderful pair of white vintage gloves with sewn-on pearls. They were “new” in the package and had never been worn. A bride bought them to wear in her wedding, but alas, they didn’t fit properly and she returned them. Drat! I woke this morning to find an email with an offer on a sterling silver and turquoise belt buckle I have listed in my store. Now here’s the thing, I know the price I have listed for this buckle is reasonable. In fact, if anything I could raise the price. So I had no problem declining her offer, but out of curiosity I decided to google her name. Turns out she owns a high-end spa in a major city offering facials and services in the $100 and up range. Hmmm…there’s a certain irony here. 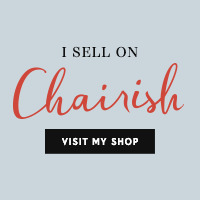 As I am running out of room in my house and garage to keep my store inventory, whilst sick I started taking a look at things I’ve had listed for a long (long) time in my Etsy shop. I’ve reduced prices and added them to my Sale section with more to add this week. Time to find new homes for this stuff. Wishing you health and happy hunting. Wanting to get out means you are on the mend! 😊 Hoping you have a great week!